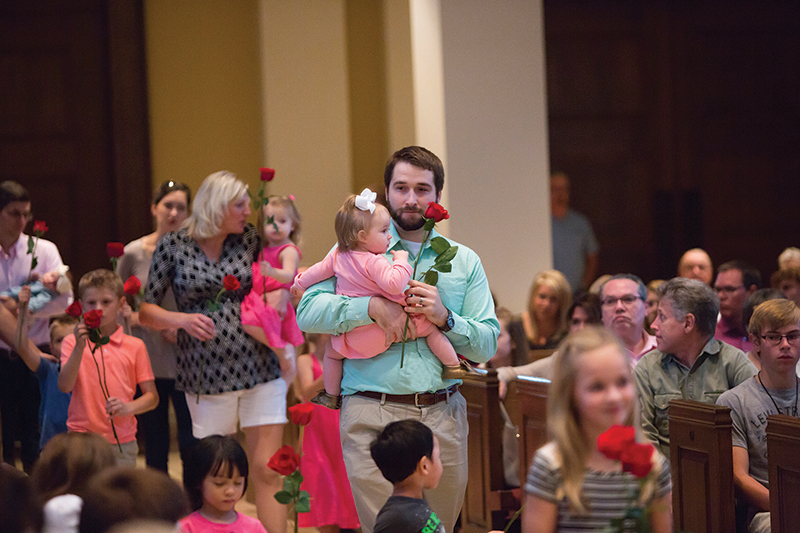 LEAWOOD — Sixty children and teens, each holding a rose, processed up the center aisle of the church. They climbed the sanctuary steps and took turns placing their roses in a vase near the altar — 60 red roses, and one white. It was both beautiful and sad. The red roses symbolized the nearly 60 million children killed by legalized abortion since the 1973 U.S. Supreme Court decisions. The one white rose represented those killed by physician-assisted suicide — now legal in five states and the District of Columbia. More states could be on the way. The rose procession took place at the 5 p.m. Mass on Oct. 1 at St. Michael the Archangel Church in Leawood as part of Respect Life Sunday events and as an opening liturgy for Respect Life Month. Catholics across the nation have observed Respect Life Sunday on the first Sunday of October since it was instituted by the U.S. Conference of Catholic Bishops 45 years ago. This year’s theme for the month — and the USCCB Respect Life Program for the year — is: “Be Not Afraid,” words spoken by Jesus in all four Gospels. Despite the long history of Respect Life Sunday, this was the first time there has been a specific opening Mass for Respect Life Month in the archdiocese. The main celebrant and homilist for the Mass was Archbishop Joseph F. Naumann. “Even before our Supreme Court legalized abortion in our nation, the church had already designated October to be Respect Life Month and this first Sunday to be Respect Life Sunday,” said Archbishop Naumann in his homily. Why does abortion remain one of the greatest human rights issues of all time? One reason is sheer numbers — more than one million children a year killed since 1973, he said. The numbers are even worse, considering the worldwide total. Another reason is the impact abortion has on the mother and the father. Often, their lives are devastated by guilt and sadness. Fathers, for their part, sometimes have a sense of failure for not protecting their children. Clinic personnel, too, often carry a burden of guilt. Other life issues include the plight of migrants and refugees, as well as systemic racism and poverty, he said. There was a reception following the Mass, when recognition was given to those who have played significant roles in assisting the archdiocesan pro-life office. The honorees were Julia Gustafson, T.D. Dorrell, Joanna Rivard and Jo Hathorn. What’s new this year for Respect Life Month? More archdiocesan activities, said Allison Donohue, archdiocesan pro-life consultant. “We hope to make all these events annual,” she said. For more information about archdiocesan pro-life activities and ministries, go to the ministry’s revamped website at: www.archkck.org/pro-life. Oct. 13: Young Adult Theology On Tap hosts Let’s Taco about LIFE, for all young adults ages 21 to 35 at Manny’s Mexican Restaurant, 207 Southwest Blvd., Kansas City, Missouri. Buy a drink and be treated to a taco dinner and a talk by Dr. Pat Castle, founder of LIFE Runners. The taco bar opens at 6:30 p.m., followed by Castle’s talk at 7 p.m. There will be a Q&A at 8 p.m. and socializing from 8:30 to 10 p.m.
Oct. 14: Wine about LIFE, an evening of wine, live music, hors d’oeuvres, and a talk by Dr. Pat Castle at the KC Wine Co., 13875 S. Gardner Rd., Olathe. Castle is the founder of LIFE Runners and the former president of the Vitae Foundation. The doors open at 7 p.m., with a welcome at 7:30 p.m. by Archbishop Joseph F. Naumann, followed by a talk by Castle. The rest of the evening will feature live music and wine until the conclusion at 10 p.m.
Tickets are $25. To purchase tickets go online. Oct. 16-20: Archdiocesan schools celebrate Respect Life Week. Students will look at a range of pro-life issues through the lens of the Catholic faith, and — at a grade-appropriate level — study the church’s pro-life teaching and discuss what individuals can do to build a culture of life. Oct. 29: One Life KC, a family event from 1 to 3 p.m. featuring pro-life community partner displays, carnival games and activities, free pumpkins and a dinner served by the Knights of Columbus. The Knights will also collect baby items for the BIGGEST BABY SHOWER EVER! This event takes place where St. John Paul II Parish meets, at Madison Place Elementary School, 16651 Warwick St., Olathe. Nov. 12: Calling all runners! Join archdiocesan pro-life consultant Alli Donohue and Father Adam Wilczak in the LIFE Runners half-marathon in Pensacola, Florida. To register, contact Donohue at: adonohue@archkck.org, or visit: www.archkck.org/events. Jan. 17-21, 2018: Young Adult March for Life in Washington, D.C. Join young adults ages 21 to 35 from the Kansas City area and all over the nation for the largest pro-life event in the nation. The cost of $550 includes flight, hotel and dinner with Archbishop Naumann. Sign up by Oct. 15 at: www.archkck.org/prolife-events.